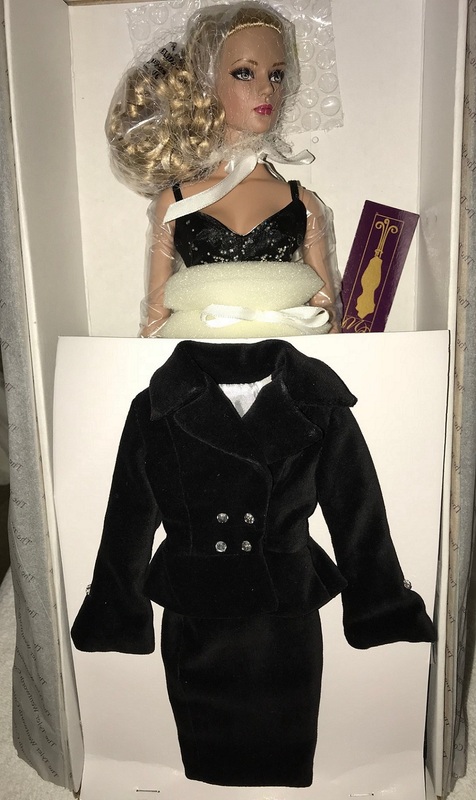 Robert Tonner Tyler Wentworth Collection - "Winter Nocturne Sydney Chase" - Special Edition for Collectors United and second doll produced from the four seasons series. Sydney is mesmerizing in a black gown featuring full black silky skirt with sheer black over-skirt and fitted bodice with thin spaghetti straps. Tiny silver balls and little crystals are scattered across the gown resembling stars in a winter sky. This look includes sheer pantyhose; strappy black satin heels accented with rhinestones and gown and gorgeous rhinestone necklace and rhinestone studs.